Access to birth control could improve health and urban growth issues in the world’s least demographically developed countries, Tim Dyson told the UN Commission in New York. 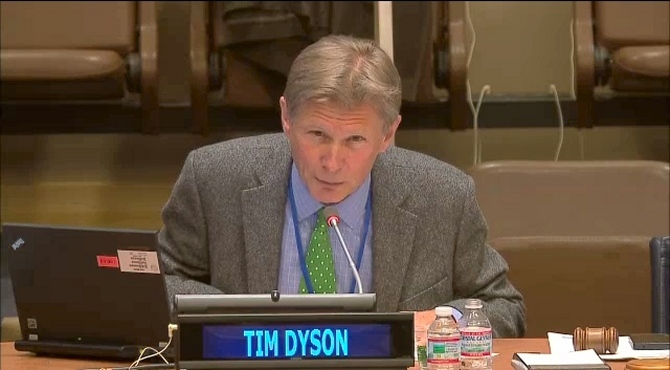 Professor Dyson’s keynote address formed part of the opening of the United Nations Commission on Population and Development, which took place in New York on 13 April 2015. “I’m not here to be popular”, he told a captivated audience during a provocative and empassioned 50-minute presentation. The speech, entitled ‘Population Dynamics and Sustainable Development’, discussed major features of the contemporary demographic transition – including rapid population growth and population ageing – before turning to the consequences of contemporary demographic trends for urban areas, the environment, the economy, and gender relations. He concluded that there are few better ways of improving the health of children, of raising the status of women, of addressing problems caused by rapid urban growth, of assisting environmental conservation, and of making ‘poverty history’ than by ensuring that people have access to safe, effective, affordable and modern means of birth control. Watch Tim’s speech here [begins at 1 hr 30].